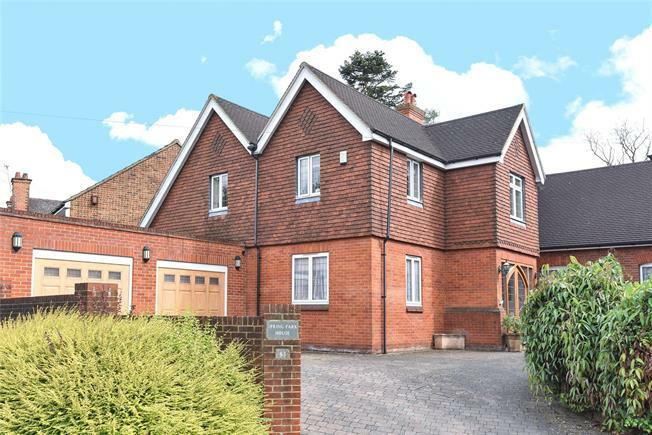 5 Bedroom Detached House For Sale in West Wickham for Asking Price £1,175,000. Chain Free. This splendid detached residence with a one bedroom annexe offers over 4300 sq ft. of accommodation. The inviting entrance hall opens to a spacious modern fitted kitchen/breakfast room, two cloakrooms, dining room, family room, games room (formally the double garage) and a magnificent reception room measuring 30' x 17'11 with stairs to a gallery. The first floor has a family bathroom, three double bedrooms, one with an en suite and a superb master suite with a dressing room and further en suite. Externally the landscaped rear garden has a patio, lawn, mature trees and a detached one bedroom annexe which comprises; reception room measuring 21'9 x11'8, kitchen, study, bathroom and a double bedroom. To the front there is off-street parking and a driveway. Corkscrew Hill is situated close by West Wickham High Street with all its amenities, West Wickham station, leisure centre and is accessible to schools and bus routes to Bromley and Croydon. Viewing highly recommended.